Thread Counts aims to engage businesses and fashion creatives across the region, supporting peer learning, research development, industry partnerships and local impact. Supported by the University’s Learning Innovation for Tomorrow programme, and RCE Severn, ‘Thread Counts’ sustainable fashion and textiles forum is a collaborative development by the University of Gloucestershire’s Fashion Design BA (Hons) course, Stroud International Textiles SIT and Atelier, Stroud. The initiative, launched in April 2017, has a shared vision to inform, engage, inspire and innovate, promoting ethical design and responsible business with students and in the community. Thread Counts seeks to provide space for local people, organisations and students, who have an interest in changing the fashion industry and how we work with textiles, to support sustainability. Through events and activities it aims to connect people so they can share skills, develop business practices and create projects that will enable the fashion creatives of our region to drive wider change together. Research development – driving a national and international agenda by recording reach and impact of sustainable and ethical design on the local community, collaborative partners and students. Education and Learning – facilitating a platform for discussion and developing pedagogic frameworks for EfS in Fashion Design and Textiles. Community impact – raising awareness of ethical textiles and sustainable fashion, promoting engagement, and creating a network for discussion, skill sharing and collaboration. Launch event – students, academics, designers, researchers, and practitioners, came together with speakers, discussions, and practical skill sharing for the whole community. Launch video coming soon. Website – to showcase good practice, and actively connect both new and established creatives, including academics, designer makers, policy makers, researchers, students and practitioners. 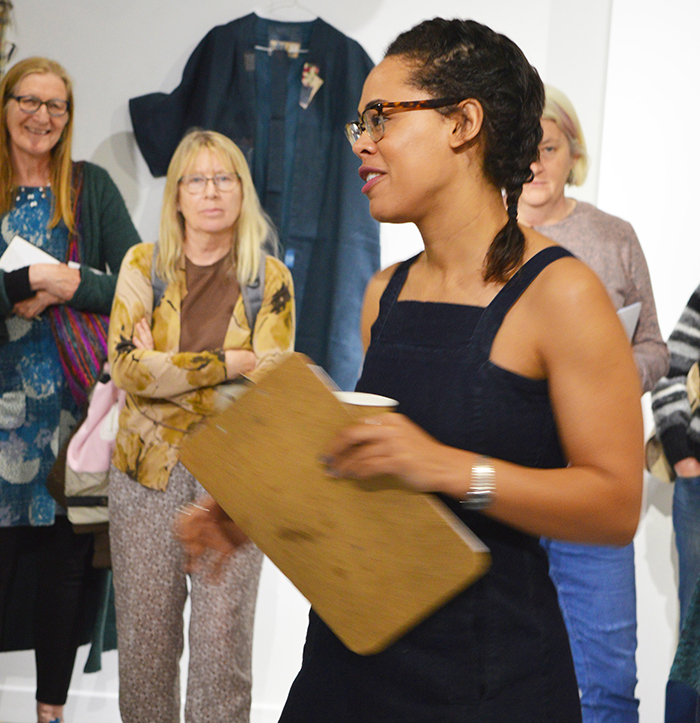 Week-long exhibition at Hardwick Gallery – supporting the launch, this exhibition at the University gallery showcased student and local work demonstrating creative, innovative, ways to re-think textile waste.